Last month, 500 DAI leaders unleashed a tidal wave of pent up energy with the public launch of a campaign zeroing in on what Dallas-area residents can do about immigration reform in the Dallas area. 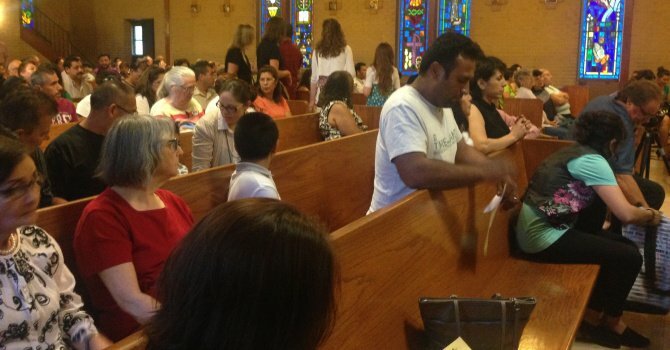 Catholic Bishop Douglas Deshotel and dozens of clergy from Catholic, Jewish, Presbyterian and Methodist denominations blessed the campaign, kicking off a summer of action to address key pieces of the DAI immigration agenda. Within days, 100 DAI leaders gathered to discuss how to support the proposition that Dallas County host 2,000 unaccompanied children from Central America. ”So many are coming without parents because their lives are threatened,” said Rev. Terry McLellan of Faith United Presbyterian. Dallas Area Interfaith plans a series of August meetings with City Council members and local law enforcement to build the political will to pass this ordinance.